Of course Key West fishing is always a great time, but if you want to kick it up a notch, this is your chance! Our Gulf Shrimp Boat trips specialty tour is a fantastic adventure that takes us out into the Gulf to take advantage of the many fish that are attracted by the by-catch thrown off the shrimp boats. In the early morning hours, shrimp boat crews clean the by-catch out of their nets and throw it back into the water. The by-catch is attractive to many Gulf species of fish, among them blackfin tuna, kingfish, permit, cobia, and many others that linger in the water around the boat waiting for a special treat. Can you imagine the sheer amount of fish attracted by the shrimp boats fishing in the Gulf? You will be amazed! Deep sea fishing charters in Key West know that the by-catch for fish is like tossing a snickers bar to a sugar addict. The fish often cannot resist and this is why it's advisable by some of the more seasoned Key West fishing charters to hook up, literally with a shrimp boat. Our fishing captains have some of the best access to the shrimp boats in the area. Not all Key West deep sea fishing charters are allowed the access to the shrimp boats that we experience. This produces an experience like no other! We set out into the Gulf of Mexico to reach the shrimp boats in the early morning. After a long night of working, the shrimp boat crews have now anchored the boats to get some well-deserved sleep. We give them some beer or cigarettes and receive some fresh chum in exchange. We are also allowed to use a boat stern line for the day and now our adventure can begin! Experience the pure thrill when fish bite every few seconds and the action never stops! This is no relaxing fishing trip, this is the ultimate fishing adventure! 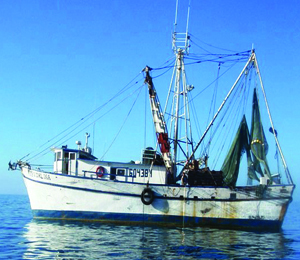 Join us for the Shrimp Boat Specialty Tour and become part of the fishing action to remember! You will speak about shrimp boat fishing as your favorite Key West charter fishing for a long time to come! I have been to the Bahamas many times, but Gulf Shrimp Boat Trips is one of my favorite trips! It includes everything that everyone should do here. As a Bahamas veteran, I can say only the best about this experience!